The Toronto Star have used Google Maps to produce a number of heat maps showing property values in Toronto. There are five maps available showing property values for: all properties, detached houses, semi-detached houses, townhouses and condos. A former Trenton base commander, Col. Russell Williams, has been charged for 82 burglaries, mostly in Tweed and a neighbourhood in suburban Ottawa. 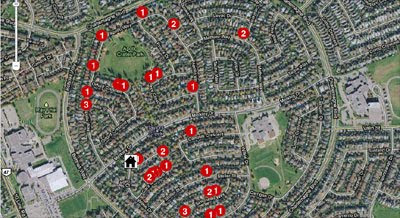 The Toronto Star has produced a number of maps showing the location of the commander's own house and the addresses of the alleged break-ins. 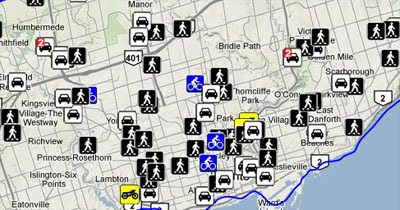 The Toronto Star's map of fatal collisions in the Greater Toronto Area has been given a bit of a revamp. The map shows fatal traffic accidents since January, 2008. The map now shows 290 accidents so The Toronto Star has unfortunately been forced to increase the size of the map significantly in order to fit in all the map markers.